Project: The Missoula Floods were a series of cataclysmic events that occurred during the last ice age and shaped much of the landscape in the Pacific Northwest. This map uses lidar to show many of the large scale features in the Portland area that were sculpted by these events. Between 18,000 and 15,000 years ago, continental glaciers formed a dam that blocked the Clark Fork River in Montana. This dam resulted in the formation of Glacial Lake Missoula, which contained 530 cubic miles of water. 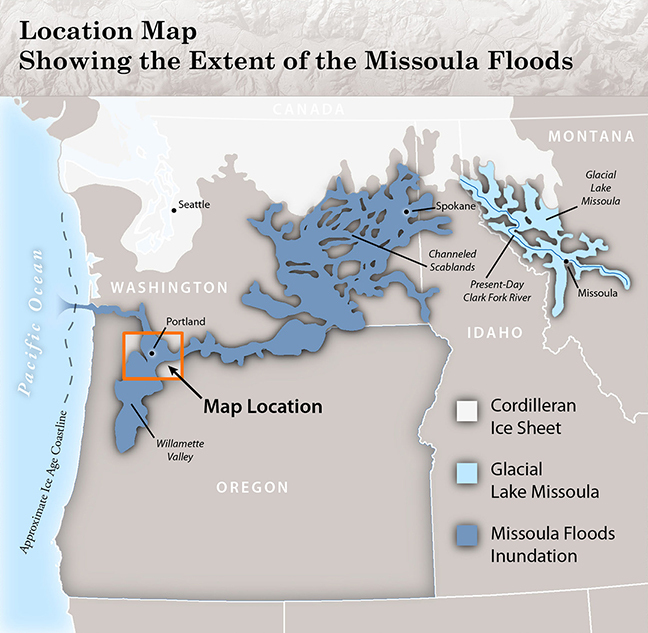 When Lake Missoula waters breached the ice dam, some of the largest floods known discharged nearly 350 million cubic feet per second—over 1,000 times the average discharge of the current Columbia River. 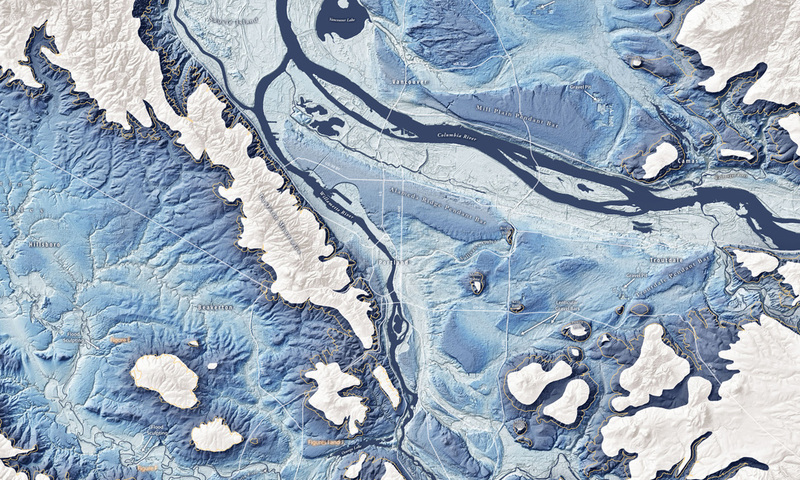 This dam-and-breach process was repeated at least 40 times over 3,000 years as the ice sheet advanced and retreated. With each breach, huge volumes of water raced across eastern Washington, eroding and depositing material before converging into the Columbia River Gorge. 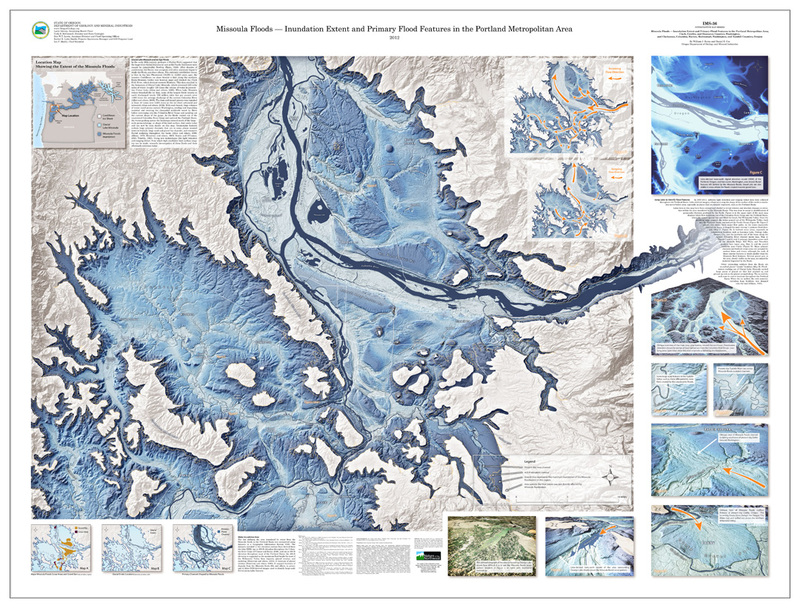 As the floodwaters rushed out of the constricted Columbia River Gorge and entered the Portland Basin, they created much of the large-scale geomorphology that exists today. Features include huge primary channels that are in some places scoured down to bedrock, large sand and gravel bar deposits, and extensive fluvial sculpting throughout the basin. Lidar data in this map were colored and shaded to reveal relative and absolute changes in elevation within the area inundated by the Missoula floods. The line defining the area inundated by the Missoula floods in the Portland Basin was interpreted using multiple GIS datasets, including maximum flood contour lines defined by previous research in the area, mapped locations of glacial erratics and Missoula floods deposits, and lidar-derived images used to identify large-scale fluvial geomorphic features.